When scientific research has obvious policy relevance it can easily become politicized. This has happened in a big way with climate science, and with some biomedical and public health research. By contrast, there are no policy makers waiting with bated breath to learn exactly what Stegosaurus’s bony plates were for. And there are no corporations that stand to make—or lose—piles of money if it were to turn out that T. rex was mostly a scavenger. Paleontology’s perceived political neutrality probably has something to do with its perennial popularity. A study that made the headlines in the spring of 2017 confirmed that dinosaur science is one area of science that both liberals and conservatives in the US get excited about. The study looked at book purchasing patterns. If you go to Amazon.com and look at the page for a book that has obvious appeal to people on the political right or left, Amazon’s own algorithms will generate a list of suggestions under the heading of “Customers who bought this item also bought.” For social scientists, that turns out to be a really interesting source of data. You can ask: If people are buying Michelle Obama’s book, Becoming, what kinds of science books are they also buying? When researchers looked at these book-buying patterns more systematically, they found some interesting differences with respect to the science books that liberals vs. conservatives typically buy. However, it turns out that everyone, on all sides of the political spectrum, likes to buy dinosaur books. There is at least some irony, then, in the fact that the Society for Vertebrate Paleontology (SVP) — the main professional organization representing dinosaur scientists — has joined in a lawsuit against the Trump administration. It’s surprising, perhaps, that the SVP would enter the political fray. Yet in spite of the potential downsides of political engagement, I’ll argue that the SVP is right to get involved in place-protective activism. The very nature of paleontological research practice, as a form of aesthetic engagement with landscapes, means that political neutrality is not a philosophically defensible ideal. In late December, 2016, shortly before he left office, US President Barack Obama created a new national monument in southeastern Utah – The Bears Ears National Monument. It’s important to be clear up front that this did not involve any seizure of private land. (For some additional context, see archaeologist Kellam Throgmorton’s discussion.) The US federal government – which is another way of saying, the American public – owns vast swaths of land in the west. Different parcels of that land are administered by different federal agencies, such as the Bureau of Land Management (BLM) and the US Forest Service. What you are allowed to do on that land depends on how it is designated. For example, companies can pay for the right to drill for oil and natural gas on BLM land. But you can’t do that in a national park or a national monument. What President Obama did, basically, was to take a huge chunk of federal land in southeastern Utah, and by huge I mean over 1.3 million acres, and call it a national monument. This had no impact on who owns it – it’s all public land either way – but it made a big difference to what you can legally do on that land. Above all: oil and gas drilling, and mining, were verboten. And as it happens, the Bears Ears includes some very significant fossil locales. Less than a year after the Bears Ears National Monument was created, President Trump issued a proclamation that reduced its size by around 85%. President Trump at the same time massively reduced the size of another National Monument in Utah, the Grand Staircase-Escalante National Monument, which Bill Clinton had established in the 1990s. Though I strongly disagree with the Trump proclamation, it isn’t quite as stupid or as evil as those of us with left-wing political views might assume. For example, it points out that some of the land that Obama had included in the Bears Ears was already protected anyway, because it was part of the Manti-La Sal National Forest. It also argues that other existing federal laws already make it illegal to loot or disturb archaeological sites on federal lands. And the Paleontological Resources Preservation Act of 2009 already makes it illegal to collect vertebrate fossils on federal land without permission. Of course, the National Monument status might mean that there is more staffing and budgetary support for monitoring and enforcement. There are basically two theories about the law. On the one hand, the Trump administration’s position is really simple: What one president can do, another president can undo. The opposing view is that the president doesn’t get to do stuff, unless the law explicitly says so. The bottom line is that the Antiquities Act on its own simply does not say whether the president gets to reduce or eliminate national monuments. The disagreement involves different views about the relationship between the legislative and the executive branches. For a helpful discussion, see Noah Feldman’s analysis. The courts will weigh in on this eventually. A group of five Native American tribes (the Navajo, Hopi, Ute, Ute Mountain Ute, and Zuni Pueblo) led the way and immediately filed a lawsuit. Theirs was followed by further lawsuits by the Natural Resources Defense Council and a group of plaintiffs including the Native American organization Utah Diné Bikéyah; the Patagonia corporation, Archaeology Southwest, and the National Trust for Historic Preservation, as well as the Society for Vertebrate Paleontology (SVP). (You can read the SVP’s press release here.) Things have been grinding slowly through the judicial system. You can read updates about the case here. One of the government’s first defensive moves was to try to get the cases heard by a federal district court in Utah, where they thought they might get a more sympathetic hearing. Last fall, Judge Tanya Chutkan ruled that cases must stay in Washington, DC, which is probably good news for the plaintiffs. But it’s not at all clear how things will play out from here. When the Democrats took control of the US House of Representatives in January 2019, a new bill was introduced that would restore the Bears Ears National Monument to its original boundaries. Of course, the bill is likely to go nowhere, since the Republican party controls the Senate, and President Trump can just veto it. Even so, the House Committee on Natural Resources has been holding hearings on the reductions of Bears Ears and Grand Staircase-Escalante. On March 13, 2019, David Polly, recent president of the SVP, testified along with tribal leaders before the House committee. In his testimony, he made an interesting argument, to which I now turn. One central issue in the dispute about the Bears Ears and Grand Staircase-Escalante is the scope of the extraction industry: oil and gas drilling, as well as mining. Coal mining is a very possibility in the Grand Staircase-Escalante, for example. I hope the SVP does not mind that I borrowed this from their website. See the full details here. Take a look at the above image that the SVP created to highlight some of the significant fossil localities in what used to be, the Bears Ears. The crossed out parts of the geological timeline on the left indicate fossil strata that will no longer be protected within the (much smaller) boundaries of the national monument. Next, take a look at this satellite image of the landscape north of Farmington, New Mexico. It’s an area I know pretty well, and where I’ve spent many summer mornings running with my dog along the unpaved access roads. 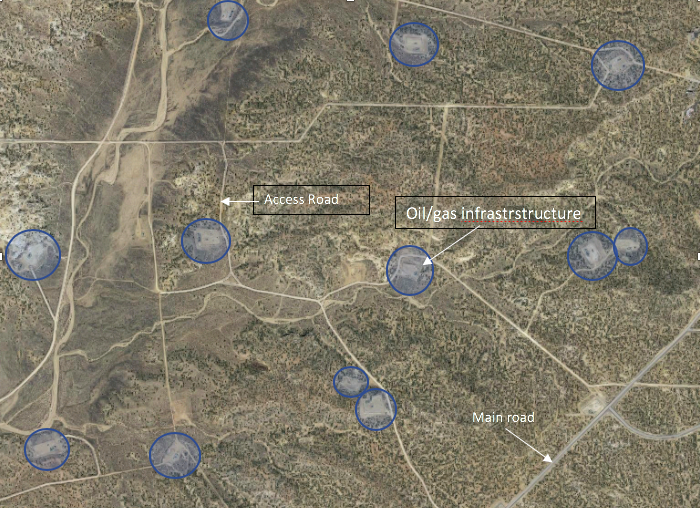 This is what it looks like when you decide to give the landscape over to oil and gas development. Oil and gas development in the San Juan Basin near Farmington, NM. Each blue circle is a pumping station or well pad, or some other infrastructure. Most of the lines are unpaved access roads. More infrastructure on BLM land near Navajo Dam, New Mexico. And while PRPA [the Paleontological Resources Preservation Act of 2009] imposes penalties for illegal collection, it does not prevent sites from being destroyed by other approved activities. For example, if mining in the uranium-bearing Morrison Formation were to be approved, the impact assessment required under FLPMA [the Federal Land Policy and Management Act of 1976] might result in mitigation consisting of excavating fossils from the site and recording information about their context. But these actions would not keep the site itself from being destroyed. The best science requires that sites will remain intact in five, ten, or 100 years so that they can be reinvestigated with new eyes and new technologies. Monument status ensures that sites will be preserved intact into the indefinite future, which is why scientists often choose to work within the boundaries of a monument instead of on ordinary multiple-use land when equivalent fossils are available in both places. Here Polly is making a compelling argument from an epistemological angle: even when care is taken not to destroy fossils, mining and other extraction activities can render a site useless for reinvestigation by paleontologists down the road. Even if scientists collect the fossils before a mining company moves in, no one will be able to go back and look again at the site where the fossils came from. This argument about the evidential value of fossils is by no means the only interesting point that Polly made in his testimony, which is worth reading in full. However, I think there are additional reasons for the SVP to get involved in this case. Should the SVP have stayed out of politics? There are some potential downside risks to the SVP taking on the Trump administration in a time of extreme political polarization. One big one is that paleontology’s popularity may have something to do with its perceived political neutrality. A second worry is that political engagement of any kind could compromise scientific objectivity, and contribute to the perception that scientists are pursuing a political agenda. These questions about political engagement, objectivity, and epistemic authority are messy and complicated. But I want to run a simple philosophical argument for the conclusion that the SVP was right to enter the fray, in spite of the above worries about the potential downsides of political engagement. This argument complements David Polly’s argument from the evidential value of fossils. (1) Paleontological research has aesthetic as well as epistemic dimensions. Reconstructing the history of a landscape is a way of deepening one’s aesthetic engagement with it, a way of cultivating sense of place. Paleontological research itself is a way of caring about places. This premise reflects a view of paleoscientific research as a form of aesthetic engagement with landscapes and with fossils, a view that I’ve been developing across a number of essays here at Extinct(see especially this one on paleoaesthetics; this one and this one on fossils; and this one on sense of place). I won’t try to defend this premise in detail here, but the animating idea is that science is never just about knowledge; studying the history of a place scientifically is a way of building a connection to that place. Claim (1) may be a bit controversial, but suppose for a moment that it is right. What follows? (2) Paleontologists have a professional interest, qua scientists, in opposing policies that would treat landscapes in ways that are at odds with their distinctive professional normative commitments. The argument, in other words, is that a certain kind of caring relationship to places is already (and should be) part of the research practice of professional paleontology. The scientific engagement with sites within the former boundaries of the Bears Ears and Grand Staircase-Escalante National Monuments is an expression of this concern for places. Because the science itself is about cultivating relationships with places, scientists (and the organizations that represent them, like the SVP) have compelling professional reasons to step up when the places they care about are threatened. It is entirely good and appropriate for the SVP to advocate for the restoration of the Bears Ears and Grand Staircase-Escalante to their original boundaries.